Pfc Burnie W. Hill, a Montford Point Marine, was posthumously honored with the presentation of the Congressional Gold Medal May 31, 2018. The medal was given to his son Clement Hill during a ceremony at MacDill Air Force Base, Florida. On Nov. 23, 2011, President Barack Obama signed the law to award all Montford Point Marines with the Congressional Gold Medal. 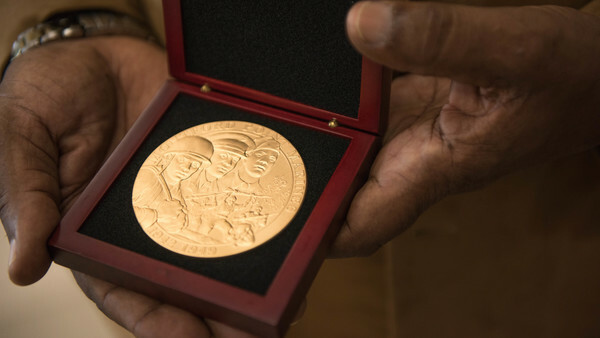 The gold medal, authorized by Public Law 112–59 was awarded to the Montford Point Marines in recognition of their personal sacrifice and service to their country during World War II. Nearly 20,000 Marines were trained at Montford Point, North Carolina from 1942-1949. Every aspect of their training was segregated from their white counterparts. They were housed in prefabricated huts and railroad tracks separated white residents from the training camp. They were only permitted on the main base of Camp Lejeune if they were escorted by a white Marine. Hill boxed while at Montford Point and while stationed in the Philippines. Following his time in the Marine Corps he went on to fight such boxers as Joey Archibald, Sugar Ray Robinson and other famous athletes. He opened a catering business and worked as a cook, then was a head chef at Pennington Railroad where he had the opportunity to cook for President Richard Nixon. “I’d like to thank everybody for this honor. I’m kind of sad my dad’s not here to receive it. I’ll probably never forget this for the rest of my life,” said Clement Hill.